Ramadan definitely came in full swing today. The fasting itself was not that bad. Of course I was hungry, but it definitely could have been a lot worse. Even at dinner I didn’t feel totally desperate to fill my plate with food. I was definitely tested today though, and it wasn’t a test of hunger. It was a test of patience, and I didn’t even realize it was happening until the day was almost over. While we control our appetites when we fast, we are also encouraged to control our tempers. I don’t think that has ever been a real problem for me. Most of the time, I’d like to think I’m a pretty patient person. I’m the oldest in my family, so I have always had to deal with annoying younger siblings and cousins. I guess over the years I’ve just learned to keep my annoyances inside, not just when my family annoys me, but in any frustrating situation. In dealing with annoying, frustrating situations for my whole life, I’ve become pretty tolerant. Things that usually annoy other people I just let slide. Today however, everything was annoying me. We had relatives here from out of town, and we were all going to a class in the evening, and for some reason, none of my plans were working out. It took me forever to figure out what to wear on such a hot day. I had already missed the World Cup game that I wanted to watch. Then I had to somehow fit in entertaining guests, picking up my relatives, running a short trip to one person’s house, then taking everyone to the class, and find time to pray and read Qur’an all in just a few hours. And of course, everyone was driving like they were drunk on the roads. Picking out clothes, missing what was supposedly a good game, listening to people talk about things I didn’t really care about, being told to do things I didn’t want to do, listening to my cousins argue with each other, trying to pick one song to listen to in the car that five people can agree on, not being able to find a quiet place to just sit and read Qur’an…I’m surprised I didn’t snap. When it got to be closer to iftar time (time to eat), as I was looking back on my day and reflecting on how many irritating situations I had been in, I realized that on any other day, none of it would have bothered me as much as it did. Normally, I would have just gone with the flow and let things roll off my shoulders. That was when I realized that it was the fasting. I didn’t feel hungry per say, but the lack of food and energy definitely made me feel on edge. One day. The very first day of Ramadan and I already was thrown into my first test. This is going to be one long month. Of course after I got some food in me, all of the negative feelings completely washed away. 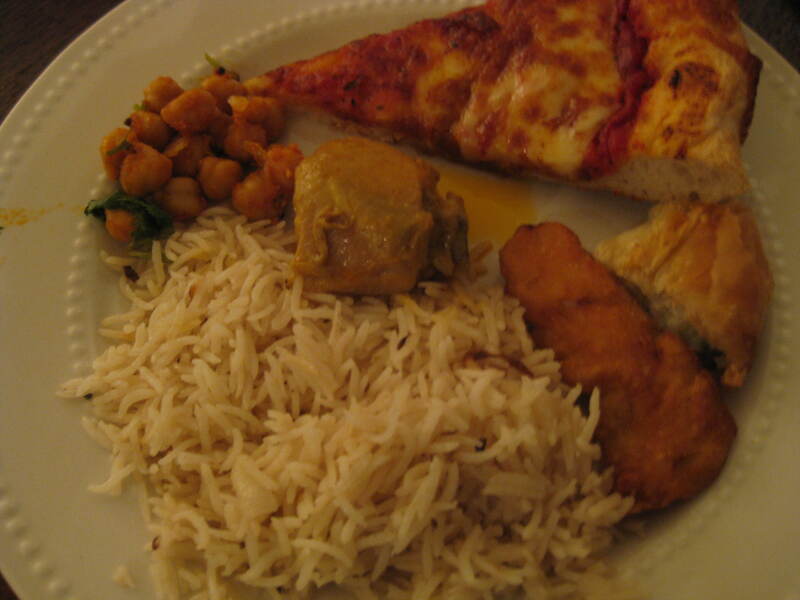 I was looking around at our little party and realized that this was a pretty nice first iftar. We ended the day with a class that turned into an interesting discussion, and afterwards we all were able to just enjoy each others’ company for iftar and dinner. It was really nice breaking my first fast of the year with my friends and family. If you’re a returning reader, you’re probably expecting an ayah of the day and to hear about how my Qur’an goal is going right about now. To be honest, I haven’t totally figured that out yet. Right now the goal is to read the entire Arabic Qur’an by the end of the month. Last year I only did about half, so this is going to be quite the challenge for me. I am going to try though. I’m already about 15 pages in out of 600. Since I read through the whole English translation of the Qur’an last year, my plan was to read through an Al-Bukhari book of Hadith – sayings of the Prophet Muhammad (S) – but I’m still not sure about that. Today was so busy with the class and having family in town that I didn’t really figure it out. Tomorrow hopefully I’ll get things sorted out. So it’s kind of a chaotic start, but hey, who said Ramadan was going to be easy? 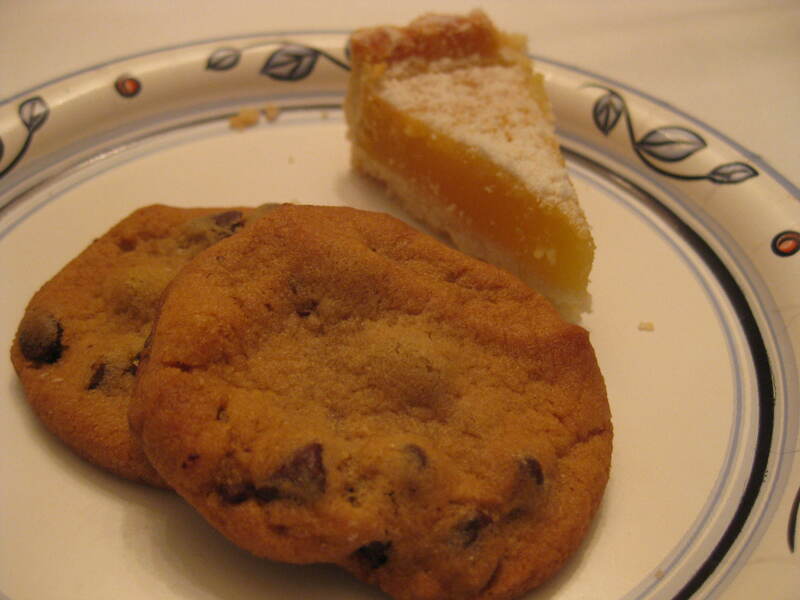 For dessert, Chocolate Chip Cookies and Lemon Tart. YUM. Happy Ramadan everyone! It’s that time of year again! That blessed month of fasting, prayer, and spiritual renewal. I am incredibly excited for this Ramadan. Well…okay, I’m not jumping for joy at the fact that I have to wake up in a couple of hours to eat in preparation of our 15+ hours of fasting, but I’m excited about the rest of the month. Amazingly, Ramadan has become about more than just fasting for me. And that is mostly because of how I spent Ramadan last year. Reading Qur’an every day, in both English and Arabic, coming up with things to blog about every day…it all forced me to really take advantage of each day and get more out of my days. That is what I look forward to this year. It seems like just a few days ago I was writing my 2013 Ramadan Log, but it’s been a whole year. I’m a year older. I’ve matured, even if not by much. My life is different. All of the important things have remained the same – my family, my friends, my school – but mentally, I’m in a different place. I have different priorities. Different goals. I’m in a different place emotionally than I was last year. I think my writing style may have changed as well, but you would probably notice that better than I. So come along with me on my journey! If you were reading my blog last year, welcome back! If you’re new to this blog, welcome to my world! I sincerely hope that each and every one of you reading this get as much out of my daily posts as I do writing them.